When Jon Irabagon last convened his quartet with Luis Perdomo (piano), Yasushi Nakamura (bass), and Rudy Royston (drums), the music of the excellent Behind the Sky felt reflective, having been written while the saxophonist mourned the loss of family members and musical inspirations. This time around, the mood is noticeably lighter. 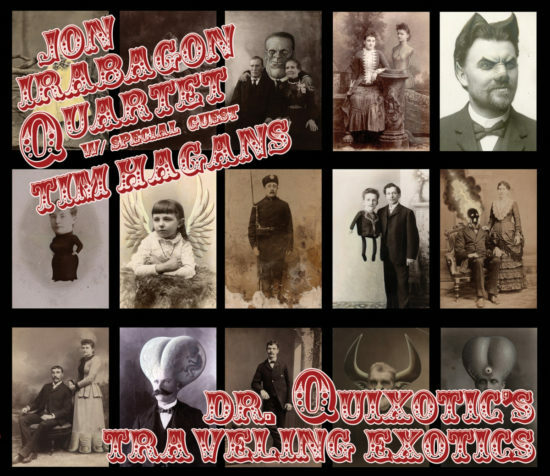 The cover of Dr. Quixotic’s Traveling Exotics is adorned with photos straight out of vintage circus freak shows. The liner notes, credited to the good doctor, offer hyperbolic words similar to a carnival barker. “These are not earworms for the faint of heart or distracted radio-loving hipsters, no,” Dr. Quixotic states, going on to call the six tracks “labyrinthine suites.” From extended improvisations with a metal guitarist to a solo sopranino saxophone album, Irabagon knows how to throw listeners for a loop. He also knows when to dial back the humor and assemble multi-leveled compositions. Trumpeter Tim Hagans joins the quartet, playing the perfect co-conspirator to Irabagon, who sticks to tenor saxophone exclusively on this set. The two horns urgently play on top of each other in “The Bo’ness Monster” without getting tangled in their respective ideas. Hagans uses a mute in “Pretty Like North Dakota,” which begins with changes worthy of a power ballad. But Irabagon has no patience for sentimentality. Although he never quite forsakes the lyrical foundation, he does eventually drive the piece home with a bold solo. The chords of “All the Things You Are” surface towards the end of “Emotional Physics/The Things,” but Irabagon abruptly closes this conversation before we can get to settle into them. Dr. Quixotic was correct: This music can be complex, but it’s better to investigate its contours than to escape this freakish labyrinth. Preview, buy or download Dr. Quixotic’s Traveling Exotics on Amazon!